I have also taken note of extensive comments (on- and off-line) from local friend and Chair of Friends of High Town (capital F, little o, capital H, capital T), David Landau, who fair lambasted me after my last, possibly dispiriting post in which I pointed out the evident disrepair and neglect of a number of units on High Town Road. He made the pertinent point, for example, that Waller is indeed a viable, even thriving concern (apparently they are more active at the rear than at the front); they are in fact so busy that they have simply not found time to pick any of the great number of littered items from their grills (in fairness, the litter is not their fault, but do they not plan to remove it? ), nor replace the faded and peeling photos in the ‘shopfront’ (which is technically the back, since they do not use it as a primary entrance; it is, however, prominently positioned on an important retail street). What has Europe ever done for us? 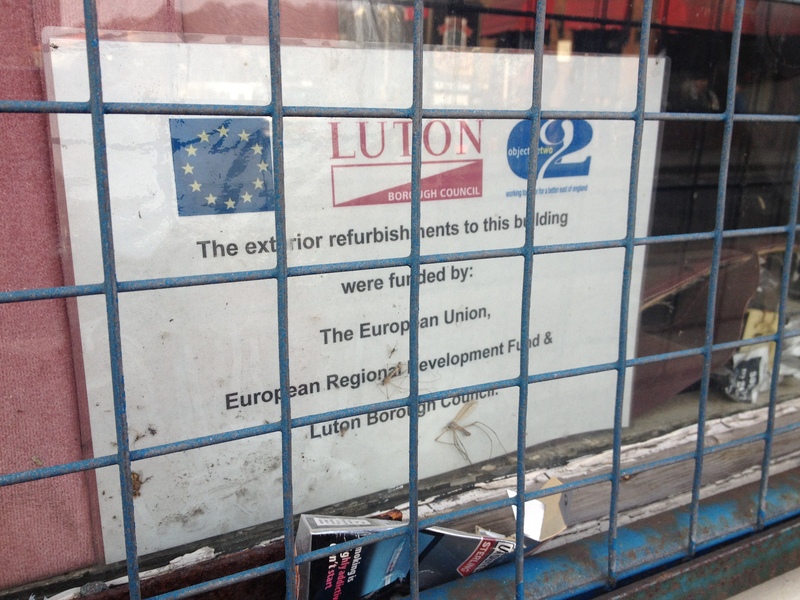 Well, Luton benefits from the European Regional Development Fund, for a start. My fellow Lutonian further lamented my lack of ‘solutions’ (or soLUTiONs, if you’re so minded). My first response to this was, ‘You want solutions as well? !’, but the point he makes is fair. I fear I may be the proverbial individual who brings problems and not solutions, but heck, is there not a place reserved even for us in the great Hightown Community Centre in the sky? My self-appointed remit here at Yoga World & Pesto is simply to celebrate what’s good, and gently point out what could be better. The upshot of this is that – horrors! – not everything I write about Luton (or High Town) will be positive. I am sorry if the prospect of more similarly hard-hitting (!) posts causes dismay, but there it is. Where I get things wrong (and I will get things wrong): lambast away. 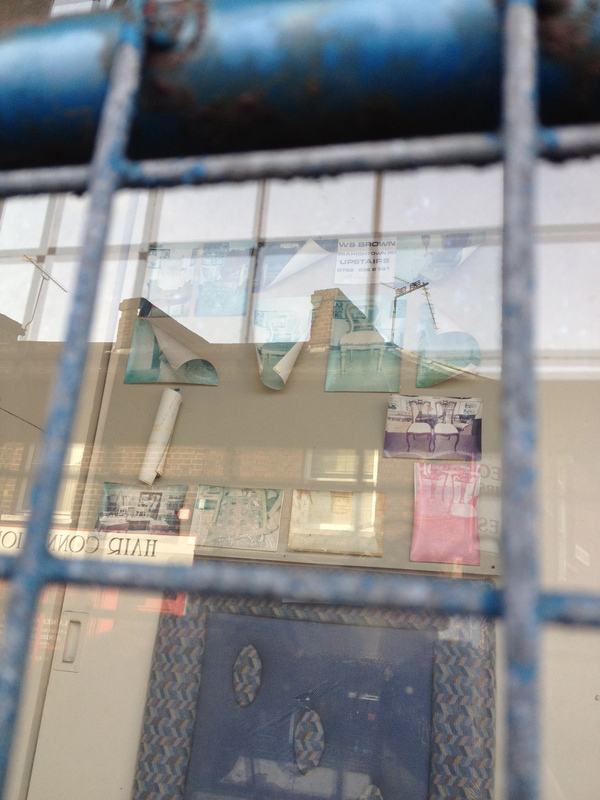 I write this blog only because I am frustrated by what feels, at times, like an extravagantly wasted opportunity here in Luton, and especially in High Town, with respect to retail. This isn’t at all – it must be strenuously noted – intended as any kind of disparagement of the FoHT, who have made sustained and generous efforts to promote and improve High Town and maintain dialogue with many of the traders, as well as direct efforts to improve and beautify the local environment. Only recently, a group of their volunteers got together to clear and replant the small garden in front of Rainbows, a child bereavement charity, as well as clear scrub from the top of People’s Park, in order (in David’s words) ‘to allow sunlight to penetrate and hopefully some native wildflowers to self-seed. We also planted hawthorn and other native bushes at the bottom of [the park], to hide ugly metal palings by the garages there.’ This is citizen action of the most helpful and real kind, and if you are interested, I warmly recommend that you attend their next meeting, on Tuesday 14 May, 7pm, at the Methodist Church Hall. He also suggested that, in some cases, the recession and generally sluggish economic climate may be to blame for the physical disrepair of some of the units. I have some limited sympathy for this (it is a brave trader who invests in capital improvements in these times), but I can’t help but wonder whether I missed the breaking news story in which window polish and dusting pads fell victim to runaway inflation. Economic depression is not an excuse for neglect; might it not be the very best time to work at maintaining existing customers and winning new ones? Is it wrong to point these things out? Is it so very controversial to suggest that the fortunes of High Town Road could, in some instances, be linked to the efforts or otherwise of the traders themselves? Conversely, is it helpful for me to point any of this out? Yoga World & Pesto starts from the premise that there may be others like me who are willing to put our money where our (umm, collective?) mouths are with respect to supporting Luton’s independent retailers. Luton is, amongst other things, a growing hub for urban, well-educated and reflective consumers who have money to spend (not least) on their way to and from Luton train station. That so many of us do not do so at present is the real problem seeking solution. Anyway, this is all by way of a return to harness and a promise of a series of unfailingly sunny and upbeat posts about Luton and High Town (as unfailing as the British weather, that is) to follow. So next up: the cafés of Luton. 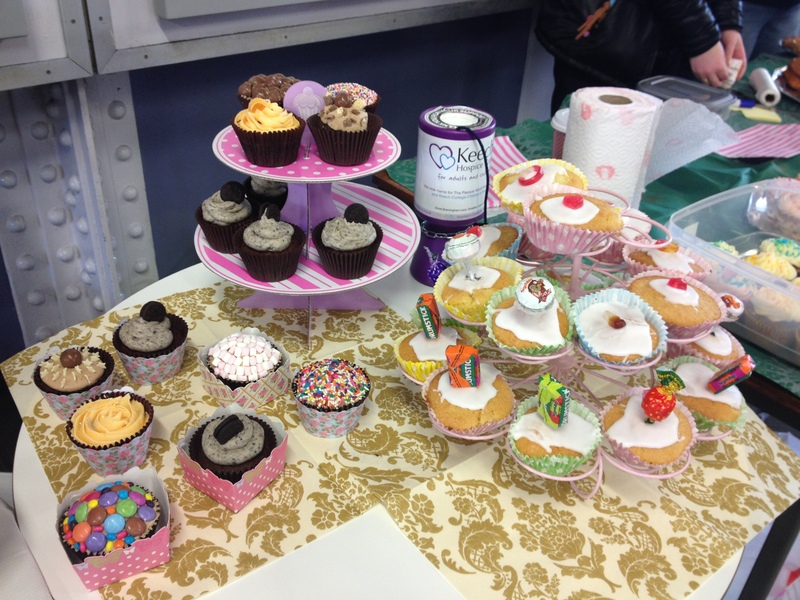 Cake sale for Keech at Luton train station in March 2013. This entry was posted in High Town and tagged FoHT, High Town Road, Hightown Community Centre, Keech, Luton Foodbank, Waller by Cappuccino Police. Bookmark the permalink. Header image on this page I also awesome ! Is it your own pic in high town? Yes it is! 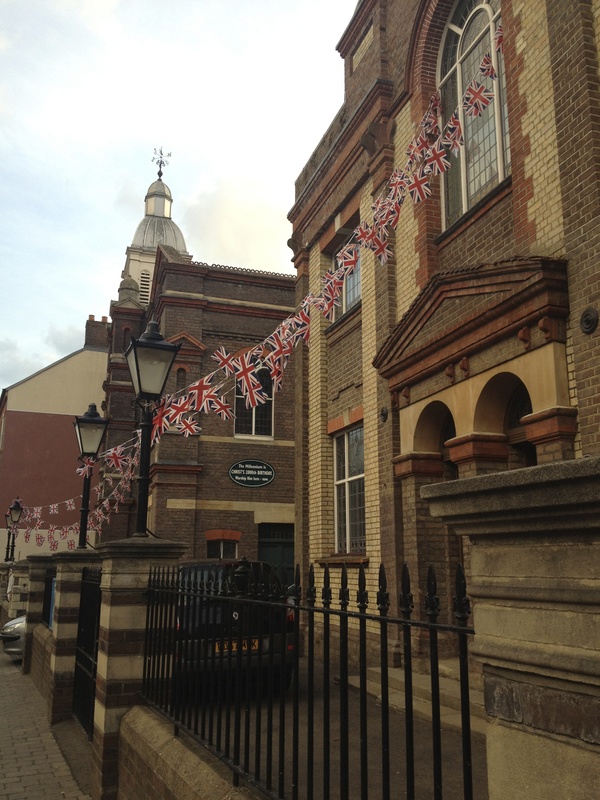 in fact, it’s on the side of my friend’s place in High Town on the corner of Jubilee Street. We don’t know who put it there, but it’s brilliant. Ah, I saw on FB that it was the 7th (and I remember thinking, that’s not _strictly_ the second tuesday of the month…). I’ll edit the article now to show the 14th.